We now stand on the threshold of historic reform of our health care system. But make no mistake, crossing that threshold, or doing so with the particular provisions in current legislation, is not a certainty. As legislators merge and amend the bills before them, it’s worth pausing for a moment and considering what this is all about: real people in real need–millions of uninsured and vulnerable Americans for whom successful reform would bring relief or for whom failure would bring additional years, possibly decades, of struggle. Research released today in the journal Health Affairs, by me with colleagues Steve Pizer and Lisa Iezzoni, shines light on a particularly vulnerable set of Americans in desperate need of health insurance and the access to care it would facilitate. In particular the study reveals that low-income people with chronic health conditions or disabilities can have outrageously high uninsurance rates, nearly 50% if they live in the south and do not qualify for public health programs (see figure below; click for larger, sharper image). How can so many low-income Americans be uninsured? It is a common misconception that a health care safety net—Medicaid—protects all such individuals. In reality, due to the design of the program and state variation in implementation, many fall through the cracks. We’ve all heard that the number of uninsured in America has been rising and that health reform would finally reverse that trend. We may be aware that we could lose our own insurance if we lose our jobs, develop a serious illness or disability, or both. What we may not be aware of is that the safety net of public insurance, the Medicaid program, is tremendously uneven and might not protect us if we really needed it. Current federal law specifies that adults with low incomes and assets can qualify for Medicaid if they belong to specific federally defined eligibility categories including: old age, blindness, disability (narrowly defined), being pregnant, or having young children. That means that, in general, under federal law Medicaid may not cover individuals who do not fall into any of these categories no matter how low their income and assets or how seriously ill or functionally impaired they may be. The states have wide discretion in setting eligibility rules for these groups. Even for those in the federal categories, states establish their own income and asset thresholds, which can vary substantially. For example, income thresholds for unemployed parents in 2009 were 21% of the federal poverty level (FPL) in Florida, 29% in Georgia, and 13% in Texas. Corresponding income thresholds were typically much higher in northeastern states: 150% in New York, 90% in Ohio, and 133% in Massachusetts (source: statehealthfacts.org). The geographic and categorical variation in Medicaid eligibility is reflected in rates of uninsurance. 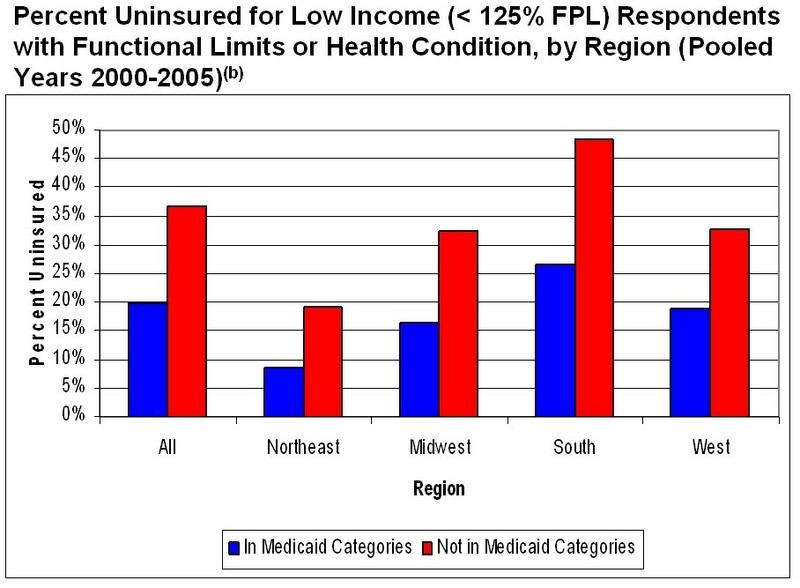 The above figure from our study, based on publicly available Medicare Expenditure Panel Survey data, illustrates rates of uninsurance nationally and by U.S. region for two populations of low income individuals with functional limitations or serious health conditions: those in federal Medicaid categories (in blue) and those who are not in federal Medicaid categories (in red). The sub-population of low income individuals with functional limitations or serious health conditions is small, about 6% of the working-age population. But it is a group that is in particular need of health insurance coverage, and as the figure shows, many members of the group fall through the holes in our health care systems’ safety net and are uninsured. Except for those in federally defined Medicaid categories in the northeast, uninsurance rates illustrated in the figure are above the U.S. population average of about 15% for the time period illustrated (2000-2005). For individuals not in federal eligibility categories and living in the south, the uninsurance rate is nearly 50%. If health reform passes in something like its current form, Medicaid would become available to all individuals with incomes below 135-150% of the federal poverty level (source: The Henry J. Kaiser Family Foundation, “Side-by-Side Comparison of Major Health Care Reform Proposals”). Regional variation in uninsurance rates for low income individuals would be vastly reduced and the seemingly capricious eligibility distinctions that exclude so many chronically ill and disabled individuals would disappear. Expanding coverage for these groups would have profound implications for their health, as described in our paper. As the debate over health reform grinds on it is worth keeping in mind what this is really all about. Those in desperate need of coverage who have fallen through the holes in the current system may not get as much attention as lawmakers and political tactics, but in reality they are far more important. @Austin – Aurthur raises good questions. While you interpret it as a loaded question, I don’t at all. There is a fundamental debate going on right now about who is responsible for helping others. Is helping others a requirement of our society? Or is it something we get to choose to do? Are we going to force all Americans to contribute to a particular charity? Is it limited to healthcare? Or does it extend to housing and food as well? When we provide too much gov’t support, some people take less responsibility for themselves. For instance, why is it that the American savings rate has consistently declined over the last 50 years? Could it be that Social Security provides a safety net such that Americans don’t feel the need to save? China has no such program, and they are great savers. Every time we create a new entitlement (SS, Medicare, now general Healthcare) we lock down the choices of future generations. Entitlements are never retracted – people come to depend on them and you simply can’t take it away. So we should not take on such complex decisions without thinking about the long term. Given that, it is just a matter of time before we can’t pay for the program. Why would we put this burden on our children? Give our children the choice for how to evolve this country. If you lock them into funding this entitlement program, you’re taking away their freedom. Why can’t we figure out how to curb costs FIRST and then figure out the entitlement program? Why do we have to first lock ourselves into a program which we know will drive us to bankruptcy? How will America compete globally when our people are taxed disproportionately while other countries do not do this? Freedom includes the freedom to fail. Let people fail. It’s okay. When you take away freedom to fail, you incidentally take away the freedom to succeed. That’s not where we want to be. @Mike – Arthur used some loaded language. My post and paper are about individuals with disabilities and chronic illnesses. I do not consider it remotely fair or reasonable to use terms like “least productive” and “choose to live a lifestyle” with respect to those individuals or, in contrast, those without disabilities or illnesses. Those are his phrases, not mine. If he (or you) wish to have a debate about when, why, and how to provide health care (and pay for it), that’s fine, though not on this post. I will interpret comments on this post as being relevant to this post, as they should be. If you, he, or anyone else wishes to discuss how to provide insurance and health care to individuals in great need and low income, I welcome it here. If you wish to discuss other health care topics I likely have a thread of relevance in which to do so.